On February 13th, 2015, President Obama convened a summit on cybersecurity and consumer protection at Stanford University to respond to the rise in major data breaches at U.S. companies, including recent attacks on Anthem and Sony. In the lead-up to the summit, on February 12th, Michael Krasny, Ph.D., hosted an episode of San Francisco’s KQED “Forum,” a news and public affairs program that concentrates on the arts, culture, health, business, and technology. This episode was devoted to examining the cybersecurity and privacy issues to be addressed (or not addressed) at the summit. Dave Garrett, managing director of Stroz Friedberg, a global cybersecurity firm specializing in digital forensics, data breach and cybercrime response. “You all brought up the fact that critical infrastructure is not included. The summit is very targeted for specific purposes, but it does raise this issue that while the government is having these kind of showy summits with CEOs in Silicon Valley, there are equally important issues that they seem to be ignoring. … Herb brought up the smart meter issue. The government is pushing a lot of technologies out into the consumer realm that aren’t secure. Did you catch that? The government is touting cybersecurity as a top priority while they are simultaneously pushing a lot of technologies on us which are not secure, like smart meters. The content of this article is consistent with that of another recent article at this website entitled, Cyber Hackers Can Now “Harm Human Life” Through Smart Meters. How long will it take before enough people realize that smart meters are in fact a serious threat to human life and national security? Countdown to Zero Day: Stuxnet and the Launch of the World’s First Digital Weapon by Kim Zetter; Publication Date: November 11, 2014; available at: http://www.amazon.com/Countdown-Zero-Day-Stuxnet-Digital-ebook/dp/B00KEPLC08/ref=dp_kinw_strp_1. 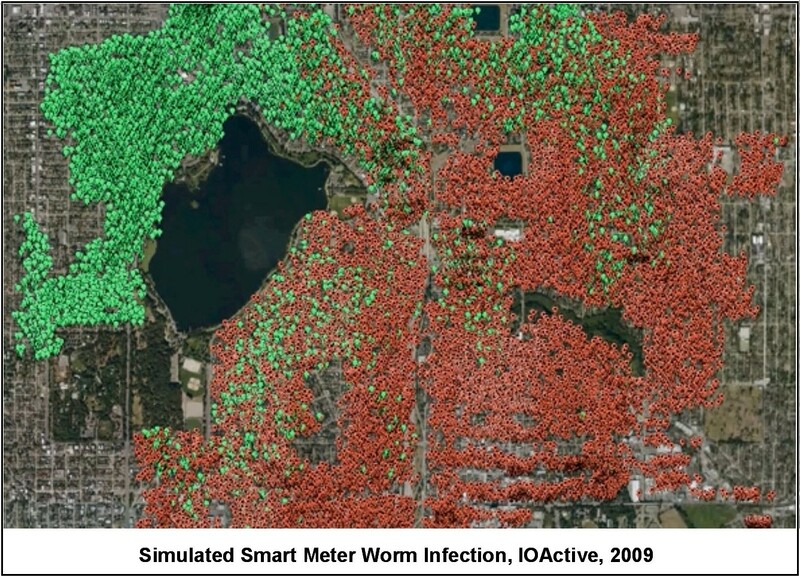 The video below shows the Davis worm simulation where an infection spread to about 20,000 smart meters over a 24-hour period. This entry was posted in Smart Grid, Smart Meters, and RF Emissions and tagged Cyber Attack, Cyber Security, Cyber Threat, Smart Meters. Bookmark the permalink.